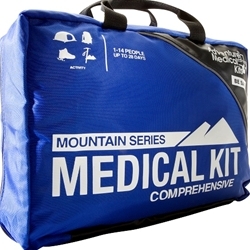 The Comprehensive kit set the standard for backcountry medical care over 20 years ago and continues to do so today. Group leaders will find everything they need to care for a large group on an extended trip in easily accessible, injury specific compartments, thanks to the Easy Care™ organization system. Key features include a fold-out organization panel for medications, a detachable Ultralight / Watertight summit kit featuring DryFlex™ technology, and supplies to treat basic and advanced illnesses and trauma, including: Glutose Gel, dental repair items, a scalpel, oral rehydration salts, a sterile scrub brush, and numerous bandages and dressings.